I am way too in love with funfetti. And cake batter. And sprinkles. I want everything to taste like cake. My coffee is included in that. Introducing coffee’s new BFF: Funfetti Coffee Creamer. About a million years ago, I posted a recipe for Cake Batter Coffee Creamer. It was one one of my first “viral” posts, which is laughable to me now because, in comparison to the Funfetti Gooey Bars, well. There really is no comparison. That post happened at what I think was the beginning of the cake batter craze. E-V-E-R-Y-T-H-I-N-G got a dunk in cake batter, and I did my fair share! At one point I think I had 7 open boxes of different cake mix flavors in my cabinet. If the apocalypse had happened we could have lived comfortably on dry cake mix and peanut butter for the rest of our days. Then somehow I found out about butter extract. I believe it was from Sally, who is the queen of funfetti. Butter extract makes whatever you add it to taste like cake. I’ve been wanting to redo that post forever and now that I’m a funfetti addict, I figured it was time. This coffee creamer is funfetti-tabulous! My BFF Aimee at Shugary Sweets is on a coffee creamer binge, which is what made me remember I wanted to redo this recipe. 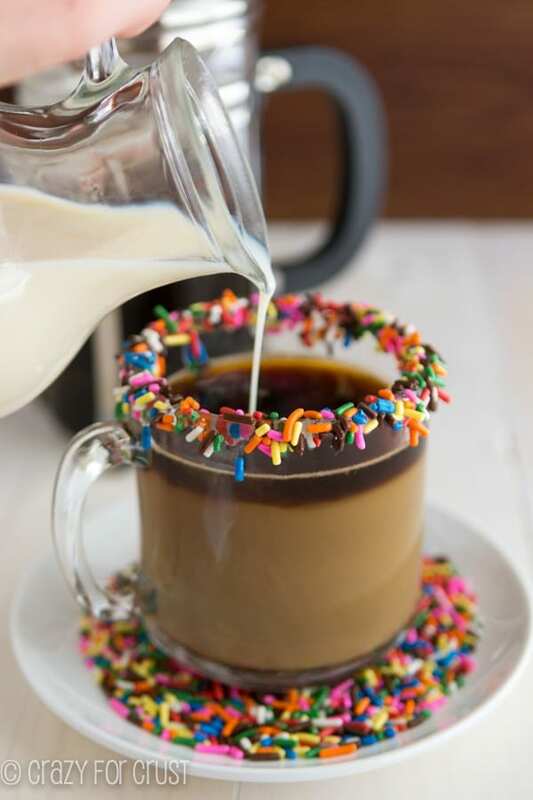 Then when were were hanging out in Miami talking about upcoming recipes, she said I should rim the coffee glass with sprinkles. That was one of those BAM! moments. I mean, does this coffee get any prettier? Plus, it’s kind of hard to convey the whole “funfetti” thing with a cup of coffee. It looks like I’m pouring milk into the glass – you have no idea that it’s a sweet and sugary cake flavored delight. But when you add sprinkles to the shot, it’s pretty much a given. 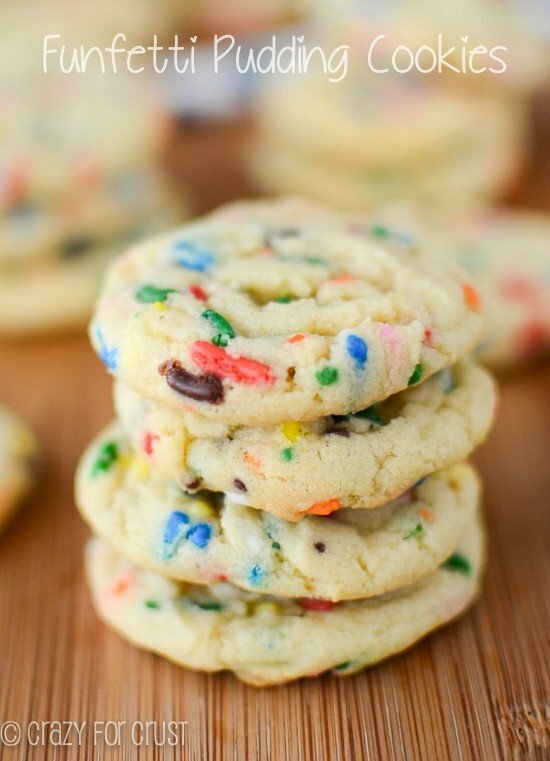 Sprinkles = Funfetti = Love. Oh, and you know what is better than coffee with funfetti creamer? 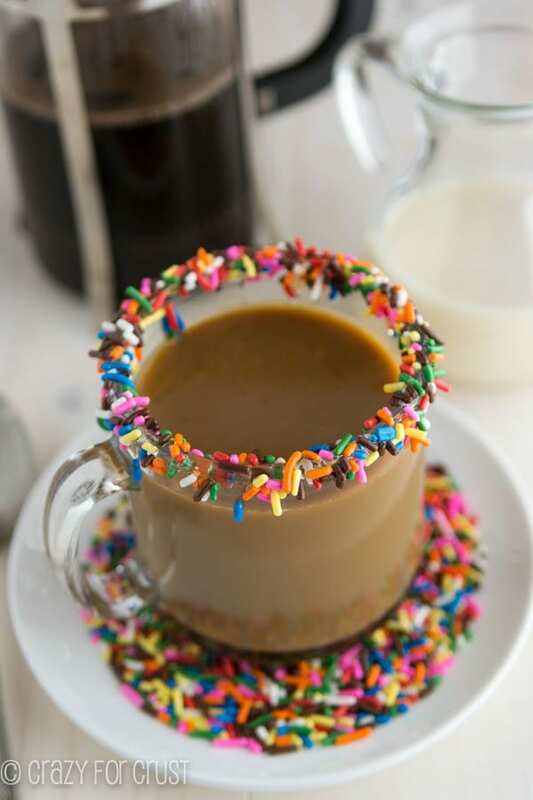 ICED coffee with funfetti creamer, Cool Whip and tons of sprinkles. Making your own coffee creamer is probably the easiest thing ever. You only need 2 ingredients for the base recipe: sweetened condensed milk and milk. I used fat-free for both, but you can use what you like. I haven’t done it, but I’m pretty sure you could also sub almond milk or coconut milk for the nonfat/regular milk. If you don’t drink coffee, you can use this in so many other things. It would be awesome in a milkshake or hot chocolate, or on ice cream. It’s like drinking liquid cake! The creamer gives some sweetness and flavor to your coffee, so you can have cake for breakfast and feel okay about it. Then you can have cake again for a snack, and again after lunch in an iced coffee. It’s funfetti all day long. That’s a good day, in my book. Sorry, I really loved these photos and couldn’t choose which to put in the post. So I used them all. I wanted to shout “Clean up on aisle dining room! !” but then I realized the cleaning crew is…me. If you love cake batter or funfetti and you’re as addicted to coffee as I am, you need this in your life. Be sure to rim your mug. It’ll make you smile, and if you’re like me, you need that at 6am! Coffee creamer that tastes like CAKE!! Place sweetened condensed milk and milk in a small saucepan. Heat over medium heat until combined. Remove from heat and stir in extracts. Pour into a jar and store covered in the refrigerator for up to 2 weeks. 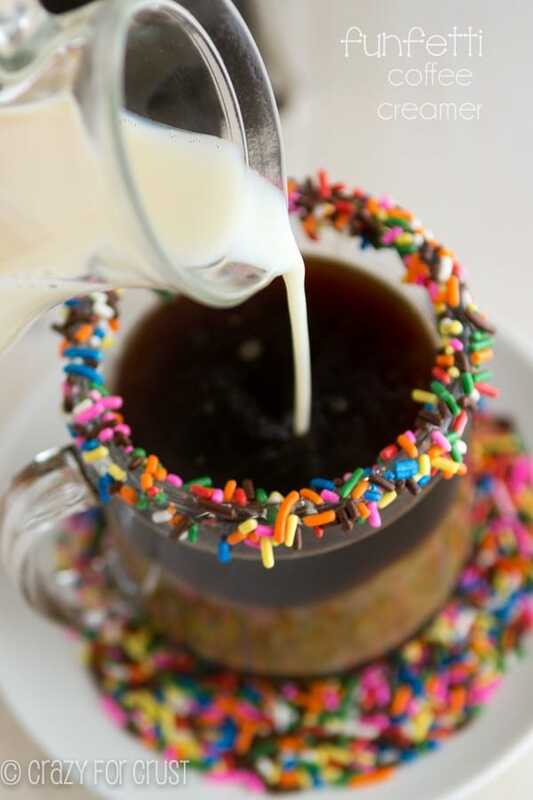 Serving suggestion: rim your coffee mugs with corn syrup or honey and dip them in colorful sprinkles. 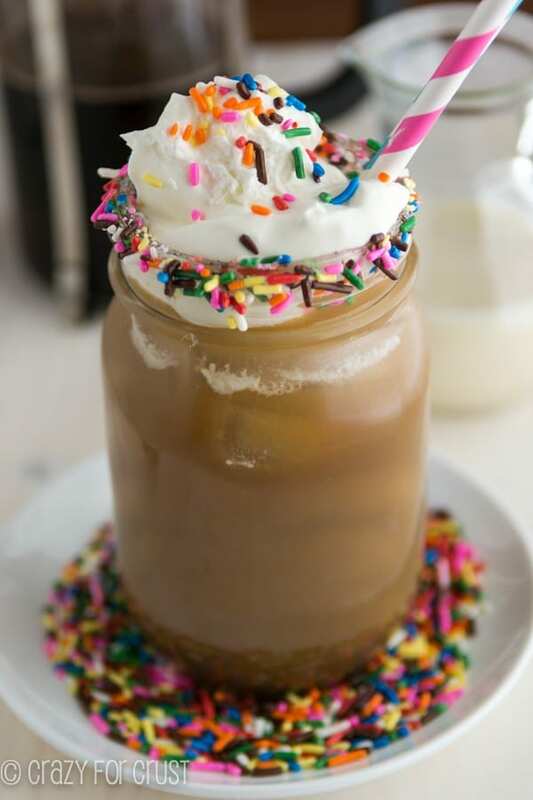 Top iced coffee with whipped cream and more sprinkles! As I was obsessively researching cake recipes for my husbands birthday cake I came across a cookbook, momofuku, that says to use imitation vanilla extract in funfetti type things to give it that true box cake funfetti taste we all love. Thought that might help you kick this up a notch ☺️ Can’t wait to make it for the hubby. How fun!. 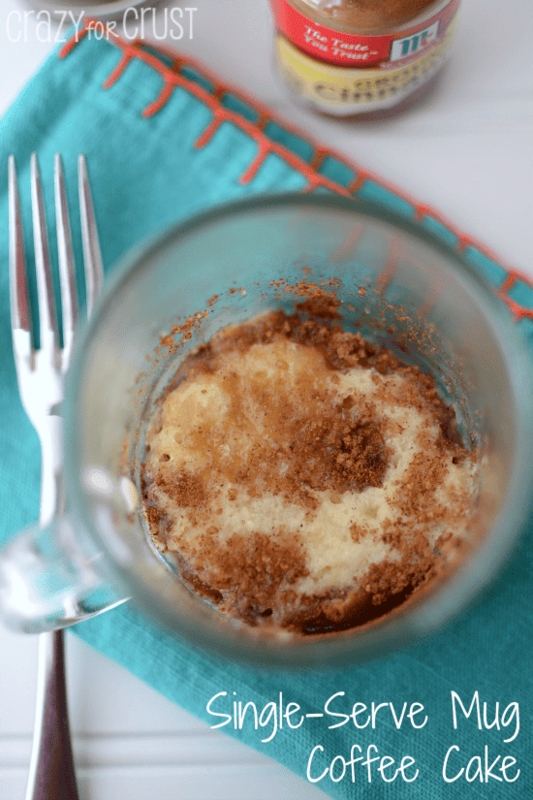 Sweetened condensed milk makes just about everything better! Yes it most certainly does!